"Now Cherokee Nation denies her," the president tweeted. "'DNA test is useless.' Even they don't want her. Phony!" 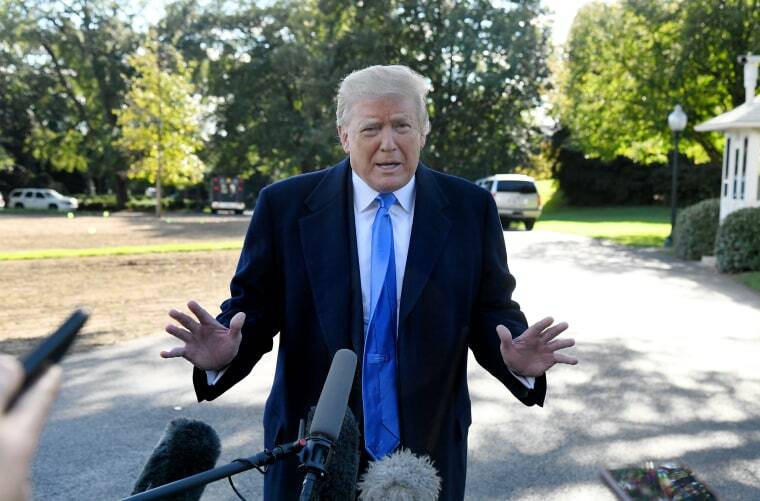 President Donald Trump ripped Sen. Elizabeth Warren Tuesday — one day after the Massachusetts Democrat released a DNA test that said there was "strong evidence" she was of Native American descent — for having the test rejected by the Cherokee Nation. "More Pocahontas (the bad version), sometimes referred to as Elizabeth Warren, is getting slammed," Trump tweeted. "She took a bogus DNA test and it showed that she may be 1/1024, far less than the average American." "Now Cherokee Nation denies her," he added. "'DNA test is useless.' Even they don't want her. Phony!" In a second tweet, Trump said Warren's "claims of being of Indian heritage turned out to be a scam and a lie" and demanded she "apologize for perpetrating this fraud against the American Public." In a third tweet, he thanked the Cherokee Nation for "revealing that Elizabeth Warren, sometimes referred to as Pocahontas, is a complete and total Fraud!" Shortly after, Warren fired back at Trump, accusing the president of "racist name-calling." Trump’s tweets were in reference to fallout that came after Warren — who has faced repeated ridicule from the president for claiming that she is of Native American heritage — released a DNA test on Monday that says there is "strong evidence" to back up her claim. The test, conducted by Stanford University professor Carlos Bustamante, a genetics and genomics expert, concludes that there is "strong evidence" that Warren's "DNA sample of primarily European descent also contains Native American ancestry from an ancestor in the sample's pedigree 6-10 generations ago," according to the test's executive summary. But the Cherokee Nation rejected Warren’s release of her test in a scathing statement. "A DNA test is useless to determine tribal citizenship. Current DNA tests do not even distinguish whether a person’s ancestors were indigenous to North or South America," Cherokee Nation Secretary of State Chuck Hoskin Jr. said. "Senator Warren is undermining tribal interests with her continued claims of tribal heritage," he added. Warren later responded to the statement with a tweet acknowledging that "DNA & family history has nothing to do with tribal affiliation or citizenship, which is determined only — only — by Tribal Nations." "I respect the distinction, & don't list myself as Native in the Senate," she tweeted Monday. Earlier, she’d released a video along with her test results that showed her retracing her roots in Norman, Oklahoma and that featured testimony from three of her brothers, a nephew, and a cousin who is a Cherokee Nation citizen. The release of the test and video highlighted how prepared Warren is to take on Trump over the insults and suggests she is working to shore up potential political weaknesses before a possible 2020 presidential run by addressing charges that she misrepresented her family background to gain unfair advantage in her career.